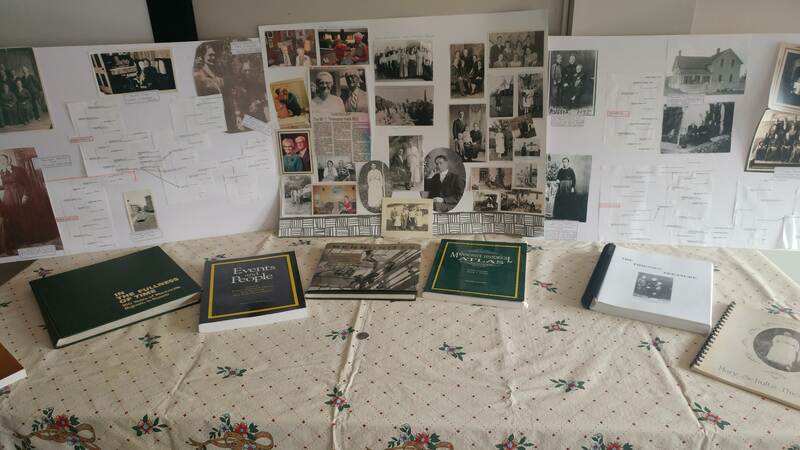 The family history display from my last family reunion. Lately, I have been thinking about my ancestors. It's sort of normal, and sort of completely strange for me. Encounter #1: A friend of mine pointed out that settlers (like myself) are always jumping right in to talk about business (or whatever "the point" of our presentation or conversation is) without properly introducing who we are and where we come from. She said that she always wants to say, "wait! Who's your grandma?" It was kind of a joke, and also very real. Encounter #2: That same friend was doing a signing ceremony for a play commission she had received. She decided to make what would normally be a lame business transaction (email, print, sign, scan, email, print, sign, scan, email) into a proper ceremony. It was amazing. At one point near the beginning, she spoke of her ancestors, and then referred to the empty chairs around the room and said that they held the ancestors of us, her witnesses. Encounter #3: Recently at an event about reconciliation and the arts, another statement that stuck with me: a woman was speaking about how settlers often mispronounce the names of the nations we are trying to "honour" in our land acknowledgements. She said, "when you pronounce it wrong, the ancestors hear you and they won't honour you." Bonus Pop Culture Encounter #4: This article about the movie Coco and looking to our ancestors, as well as Coco itself. If you haven't seen it, go watch it! The first encounter mulled around in my mind for a while. I realized that I never spent much time on myself when I was speaking for two reasons: I thought the content of whatever I was there to share was way more important and interesting than me as a person and I had spent too much time in acting classes where people talk for five minutes humble bragging about themselves during circle check-ins. The second encounter immediately pierced my heart. Tears sprang to my eyes. The image of my ancestors sitting with me was tangible and deeply meaningful. The third encounter was a striking reminder that honouring land and people isn't just about who is alive now, but who is now buried in the land and all the links between them and us. The bonus pop culture encounter made me think about how I honour my ancestors, or not, in my life. When do I think about them? When do I remember their stories? What strength do I gain from them? On one hand, my childhood was full of the stories of my ancestors. When I was young, my family was in the process of documenting the story of my great grandma. We have homemade books full of family stories and meticulous family trees that we couldn't wait to add to when an entire new branch of the family was discovered. One could argue that it doesn't really matter. This isn't The Chilling Adventures of Sabrina, where their ancestors' lives and stories have an actual, material impact on their everyday lives and choices. (If you haven't watched the show, all you really need to know is that peoples' ancestors have an actual, material impact on their everyday lives and choices.) This is actual life where you can go through a perfectly fine existence without knowing anything about your great aunt. But still. I can't stop thinking about them. What do you know about your ancestors? Do you have ways to honour them in your life's rhythms? Andrea, this resonates really deeply with me. I know so little of my family history that it's hard to imagine my ancestors, much less feel them sitting with me.